Drag & Drop table added further down on this page for 1 vs 1 comparisons. Note: All of these service providers offer Linux servers by default. Linux is what most people will need for building websites. If someone needs a Windows server, they will know it. Dedicated hosting is exactly what the name implies, that you have a server that shares no other resources with anyone else. It is the direct step above VPS. All of the hardware and resources and directly dedicated to you. 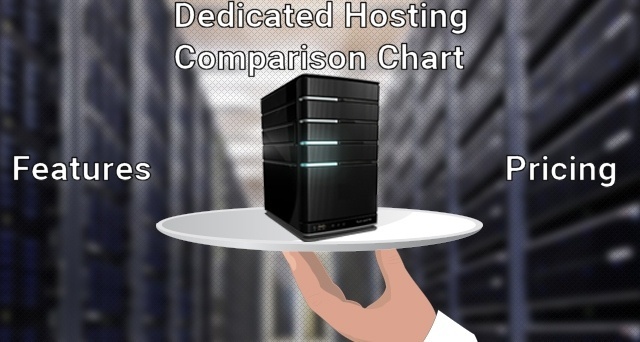 If you’d like to see see how dedicated hosting compares to other types of hosting then click that link for a quick 1 minute video. When would you need a dedicated server? You’re website generating a whole lot of traffic and you’re either running out of resources in your VPS or you are maxing out your bandwidth. If you find yourself in the position that your websites traffic has picked up and your website doesn’t load as quickly as it did when you first got that VPS hosting… then you are now at the stage to consider moving on to a dedicated server. What’s the difference between Managed Dedicated and Unmanaged Dedicated Hosting? The difference comes down to 3 things: your expertise, time, and price. If you opt for an unmanaged server then you are the type of person that is very technical and are trained in how to run a server and manage all of it’s needs. It does take more time and the solutions do not usually offer support that will be able to assist you in diagnosing errors unless they are hardware failures. The pro of an unmanaged dedicated host is that they are usually quite affordable. You could save 10-40% of what you will pay for a managed solution. Which is what is listed in all of the charts here. If you would like to seek out unmanaged servers then OVH is an excellent solution. This is the environment most people will be typically be use to. It’s exactly like the shared web hosting or VPS experience in the area that all server technical aspects are hands-off to you as the customer and the web hosting staff takes care of all of it for you. Support is the biggest plus here. If you do not have alot of experience with server-side issues then you will want to take the managed server route because the support from the hosting provider can help you solve these issues. The support is also not your typical kind of staff members either. They are very well trained and know exactly what to look for to diagnose your sites server errors. So when it comes to support know that you will have a better experience than you did with shared hosting but keep in mind you are paying for it. I believe it’s worth every penny and it’s tax deductible for my business anyway.